DO YOU HAVE YOUR OWN COMPUTER FOR YOUR BUSINESS? Most likely, your household has a computer or two that is used by everyone. That’s fine for personal use. However, if you have a home office, you need your own computer. You don’t want to be in the middle of answering your e-mails or writing a proposal when another member of the household suddenly interrupts you because they need to look up a movie schedule or do homework. Before I discuss your options, let me state that buying a new computer is not the budget breaking experience it was in the past. Prices are well under $1,000 for a state-of -the-art Windows computer while MACs will run slightly higher, based on your needs. 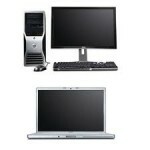 There are two types of computers; desktops which have a box and a separate monitor (there are a number of all-in-one models available), and laptops. Desktop monitors vary in size and can be as large as some TV screens. They are meant to be used in one location. There are different types of laptops. Their advantage is that they are space savers and, except for the larger models, mobile. The largest, usually weighing over 7 pounds, have monitors as large as 17 inches and are considered “desktop replacements.” They are not meant for mobile use. The most favored group of laptops weigh under 5 pounds, with screen sizes in the 13”-15” range. These mid-size models are not only space savers, but you can travel with them. They are large enough to use as your main computer, saving on having to buy a second computer for the road. The third type of laptop is called a netbook. It weighs under 3 pounds with a 10” screens. The keys are small, and are meant for people who need a full function computer for travel purposes only. Tablets are in the news and growing in importance. Everyone seems to want an iPad, and it has been dominating the tablet market. As we look at it from a business perspective, it can be a useful tool for roaming around your home and on the road with Internet access either through Verizon or ATT or a wherever a wireless network is available. Its features include the ability to use the Internet for e-mail, access your music, contacts and calendar information. However, despite Apple’s claims, it has not replaced the computer, since typing documents on a touch screen is a challenge. Additionally, printing is an issue, and it does not come with any input devices such as a USB port although adapters are available. The decision concerning what to purchase will be based on the nature of your business and whether you will be operating mainly in your office or on the road. The specifications of the computer (speed, hard drive size, etc.) will not be the determining factor in your decision, since they all have the capacity to address your individual needs. Speed is overrated. The difference in either buying a computer with the fastest chip or one that is a step lower can be hundreds of dollars, and you will never notice the difference. The fastest and most popular chips are Intel’s i3, i5, and i7 models. However, computers with chips from AMD are less costly and are fine unless you require a high performing model. Memory (RAM) is probably the most important and least expensive component. At least 3 gigabytes (GB) and, ideally, 4 GB is recommended. Windows computers should be “64 bit” for maximum performance. As for Hard disk space, 350 GB should be the minimum, although 250 is OK. 500GB is an option for large file storage. Check the prices. All computers come with USB ports to attach printers and other external devices. The standard is USB 2.0. However USB 3.0 is entering the market although, at this writing, there are few external devices that are able to operate at a faster speed. Most laptops come with a built in camera for video conferencing but check before purchasing. If you are buying a separate monitor either for a desktop or to use with your laptop at home, make sure it comes with the camera. If your existing monitor does not include a camera, you can purchase one for under $100 that attaches to the top of the monitor. The issue of Windows vs. MAC always comes up, and there is no clear answer. Windows based computers still represent close to 90% of all computers in the market. Large corporations still depend on them since most major business applications (programs) are written for Microsoft Windows. MACs are very popular for personal use, and many small business owners own them. MAC desktops and laptops are more expensive. However, as of yet, they are not prone to viruses and other malicious attacks and are regarded as easier to use. I own both, a Windows for my business and a MAC for personal use. MACs can run Windows at an extra cost if you need a Windows based program. However, if you include Windows on your MAC, you will need the standard anti-virus and spyware protection as discussed earlier. If you have any questions about selecting a computer or any other technology issues, you can contact me at 917 921-4518 or by e-mail at jblue@bluetutor.com. Selecting the right chair will save your back. Make sure your back is supported, and that you are not leaning over to view the monitor. Kitchen and dining room chairs should not be used. Invest in a good chair. Traveling overseas? Concerned about keeping in touch? Using your cell phone will be expensive. If you bring your laptop and have Internet access, you should have a MagicJack as a companion. Pictured on the left, a MagicJack is a tiny device that is plugged into one of the USB slots in your computer. The device costs $39.99 with an annual fee of $19.99. Not only that, but when you purchase a MagicJack, you get the first year for free. No monthly charges. 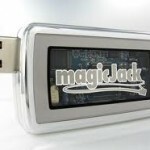 You can purchase one at places like Best Buy or online at magicjack.com. How does it work? When you sign up, you select a phone number with your local area code (in New York, either 917,646, or 347). What this means is when you plug your MagicJack into your computer, you are calling through the Internet and you can call anywhere in the US for free. This works also in the US. So if you don’t want to use your cell phone from a hotel room or borrow someone’s phone, stick the MagicJack into your computer and make your call. If you want privacy, you can use a headset. Free caller ID, free voice mail, free directory assistance……. Free …. Free …. Free!! If you have any questions regarding MagicJack or any other technology issues, give me a call at 917 921-4518 or e-mail me at jblue@bluetutor.com. Whether or not you realize it, you have been using a cloud based service since you first started using a computer. These services include AOL, Hotmail, and G-Mail accounts. Chances are they you are one of the half billion plus members of Facebook. Well, welcome to “the cloud!” Simply defined, cloud computing means having every piece of data you need at your fingertips and ready for use, being able to access all of your personal data at any given moment, having the ability to organize and store data from any computer, and on any model device. Using the cloud permits you to share that data (proposals, photos, movies, contacts, e-mail, documents, etc.) with your friends, family, clients and coworkers. 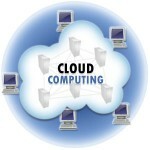 There are many excellent free cloud based programs that are extremely useful for your business. My favorite is Dropbox. I store all data in Dropbox that I would like to access from another computer or my mobile devices while on the road. You can store up to 2 GIGs for free. For $9.99/mo., you can store 50GIGs. I find the free version is plenty for carrying around what I need. As I write this blog, it is stored at Dropbox in order for me to able to work on it from wherever I am located. Another favorite of mine is Evernote. Instead of carrying around little scraps of paper with reminders scribbled on them, I enter them from any computer or mobile device into Evernote. Both sites are password protected. There are a host of other cloud based services and programs available ranging from news services, financial market reports, video conferencing, movie listings, flight information, hotel reservations, weather, etc. No need to be afraid. Accessing the cloud is safe and secured as long as you know the site. You do it on your personal computer every time you use the computer. With the world becoming more mobile and the fact that, in just a few years, more people will be accessing the Internet through one of the handheld devices (Blackberries, I-Phones, I-Pads, and Androids), cloud computing will continue to gain in popularity. So, get with it! Join the cloud group. If you have any questions regarding cloud computing or any other technology issue, give me a call at 917 921-4518 or e-mail me at jblue@bluetutor.com. WANT TO ACCESS THE INTERNET ON THE ROAD? While many of us now own a “smartphone,” I-Pad or other small tablet size device with Internet access, a full size laptop is often necessary to work on documents and other projects that are not easily managed on handheld devices. It is now possible to buy a laptop with wireless access using the cellular networks. However using your provider’s (Verizon, AT&T, etc.) cellular network to access the Internet can be slow and spotty. 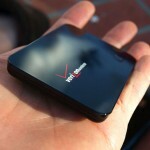 My solution is a credit card size device from Verizon called Mi-fi. This mobile device permits me faster access to the Internet using wireless technology (which is faster than the cellular network) for as many as 5 wireless products at a time. With my Mi-fi card, I no longer need to look for a hot spot for Internet access. I can work in the park, in my car or commuter bus or train. Not only am I free to work anywhere there is service, the connection is secure since the device requires a password, which means that no one is able to join my network, much like being at home with a secured router. I am able to access sites requiring passwords and bank accounts without worrying about my neighbor sitting in a coffee shop next to me accessing the same unsecured network. Yesterday, the Internet in my home was down. No problem. I simply turned on my Mi-fi device and the three of us were all able to use the Internet simultaneously until the situation was resolved. The Mi-fi is not for everyone and it costs a minimum of $50/month based on your usage. In addition, while you are able to get a global model, the costs of using it abroad will be exorbitant, similar to using your phone overseas. Better to use a wireless hotspot (although not secured). However for those of you that require secure Internet access on the road, it is an excellent accessory. If you have any questions about the M-fi, or other technology issues, give me a call at 917 921-4518 or e-mail me at jblue@bluetutor.com.